Monday, March 25, 2013 ratings — New episodes: The Voice, Revolution, How I Met Your Mother, Rules Of Engagement, 2 Broke Girls, Mike & Molly, Hawaii Five-0, Bones, The Following, Dancing With The Stars, Castle, and The Carrie Diaries. Episode reruns: Hart Of Dixie. 8pm – Dancing with the Stars: 2.3 in the demo (-28% change) with 14.08 million. 10pm – Castle: 2.1 in the demo (-5% change) with 10.69 million. 8pm – How I Met Your Mother: 2.7 in the demo (-10% change) with 6.85 million. 8:30pm – Rules of Engagement: 2.1 in the demo (-9% change) with 6.18 million. 9pm – 2 Broke Girls: 2.9 in the demo (+4% change) with 8.55 million. 9:30pm – Mike & Molly: 2.6 in the demo (+8% change) with 8.64 million. 10pm – Hawaii Five-0: 2.0 in the demo (-5% change) with 8.16 million. 8pm – The Carrie Diaries: 0.4 in the demo (0% change) with 0.94 million. 9pm – Hart of Dixie: (rerun) 0.1 in the demo with 0.42 million. 8pm – Bones: 1.9 in the demo (-10% change) with 6.75 million. 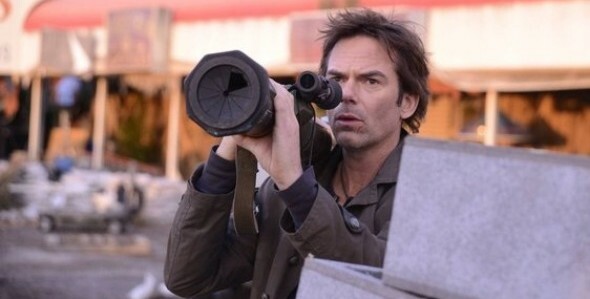 9pm – The Following: 2.3 in the demo (-8% change) with 6.63 million. 8pm – The Voice: (season debut) 4.7 in the demo with 13.36 million. 10pm – Revolution: 2.7 in the demo (-7% change) with 7.25 million. wanted to check it out. Missed a great! New Episode of Revolution. I think the reason Revolution was so low was because it’s been off the air for so long everybody assumed it was already cancelled.